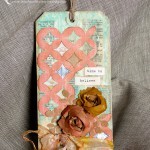 Here is another tag inspired by Tim Holtz 12 Tags of 2014. It is about adventure and traveling and has a lot of dimension. 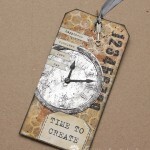 The idea from Tim for May was to use chipboard tiles to cover the body of the tag. 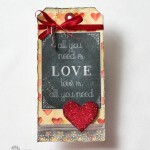 I did embossing on some of them and added different items to others. 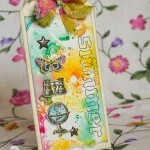 All backgrounds were created using Distress Ink of different colors. 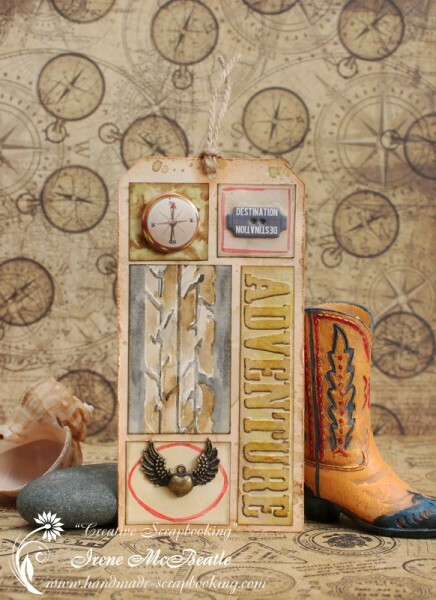 The images that I gathered on this tag are associated with travel: the big title Adventure, tire track, metal embellishment in a form of a heart with wings, compass, chipboard button saying Destination. I think I have a strong desire to travel. 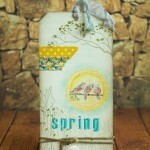 Have a great month of May and travel as much as you wish!